Looking for the perfect place to spend your Martha's Vineyard vacation? As our guest at Greenwood House, a couples oriented, bed & breakfast, you'll be treated to casual yet elegant non-smoking accommodations and home-like hospitality. Open year round, this Island getaway can be your best vacation ever! Imagine yourself relaxing in our lovely four-room inn, nestled in a beautiful, 1906 home away from all the cares of the world but just two blocks from the edge of the village of Vineyard Haven and four blocks from Vineyard Haven Ferry Terminal. Your distinctive, cozy room has a private bath and all the extras you need to make this your home away from home while you enjoy the romance of the Vineyard. And it's our pleasure to serve you a complimentary breakfast each morning. 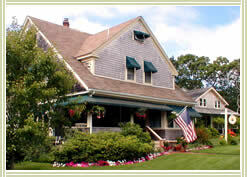 Best of all, we offer a personal touch you won't find anywhere else on Martha's Vineyard. That includes telling you about the secret places on the Island that everyday visitors don't know about. We'll also advise you about the Vineyard's best golf, tennis, swimming, jogging, hiking, and other outdoor activities. Please, explore our site. If you have any questions, don't hesitate to contact us 1-508-693-6150 or at [email protected]. "... Open year round. It is especially beautiful when the flowers are in full bloom ..."
"... The Greenwood House is one of the better values in town ..."